The Ocular Surface Center Berlin (OSCB) is a non-profit Science Institute for the advancement of knowledge on the ocular surface. It is collectively led by scientists who are working together for decades on the topic of the Human Ocular Surface and have continuously contributed to the advancement of knowledge in the field by publishing their research results in journal and book articles, by serving on the boards of international research societies and by organizing scientific congresses and symposia at international congresses world-wide. They have founded this Webpage as another and broader way to share their experience on the Ocular Surface with Scientific Colleagues in the field and with Clinical Colleagues as well as with interested Lay People and Patients for whose benefit the continuous world-wide research efforts on the ocular surface are directed. After his study of Medicine at the renowned Hannover Medical School (MHH), Germany, Erich Knop graduated as a medical doctor from the same institution. He has earned his doctoral degree for clinical and experimental research on the changes of Conjunctival Epithelial Cytology in Contact Lens (CL) wearers. Clinical Contact lens fitting studies in the Eye Clinic under the supervision of Prof. Horst Brewitt, one of the most eminent national Specialist on Contact Lenses and of Dr Eye Disease, were supplemented by Impression Cytology (IC) investigation and Cell Biological analysis under the supervision of Prof. Enrico Reale, a legendary cell biologist and electron microscopist - a scholar of the inventor of the electron microscope. Erich Knop delivered the first report that could conclusively show the onset, progression and time course of squamous metaplasia after start of contact lens wear in asymptomatic wearers of soft contact lenses. He later completed his education in Anatomy in the Department for Cell Biology and Electron Microscopy, during which time he was able to elucidate the ultrastructure and etiology of peculiar nuclear alterations (snake-like chromatin) that typically occur due to contact lens wear but are in fact a typical consequence of conditions with increased mechanical friction at the bulbar conjunctival ocular surface. He has worked as Post-Doctoral Student and as a Senior Researcher and Lecturer for all sub-specialties of Anatomy in the Center for Anatomy for more than a decade at MHH Hannover, Germany. From 2003 to 2010 he was the Director of the Research Laboratory of the Eye Clinic at the Charité–Universitätsmedizin Berlin, Germany, and later he worked in the Dept. for Cell- and Neurobiology, Center for Anatomy, of the Charité as a Senior Researcher and Lecturer. Presently he acts as the director of the Ocular Surface Center Berlin (OSCB). He is Visiting Professor at the prestigious Juntendo University Tokyo, Japan. Prof. Knop has a continuing education in Teaching, Didactics and eLearning methods and also has a strong interest in medical entrepreneurship and in international academic exchange. He has long-term teaching experience in all sub-specialties of Anatomy (Gross Anatomy, Neuroanatomy, Histology, Cell Biology and Anatomy for Dental Students as well as Anatomy for Osteopathy. Since 2008 he has a leading position as “TopProf N.1” for Medicine in Germany on the largest nation-wide public student evaluation platform (www.MeinProf.de), among over 40´000 lecturers with over 80´000 courses with his anatomical course in histology. Erich Knop received a Humboldt-Research-Fellowship of the Alexander-von-Humboldt Society in conjunction with the Japan Society the Promotion of Science (JSPS) for one year in Japan where he studied in the Departments of Neuroanatomy and Cell Biology under the supervision of Prof. Yasuo Uchiyama. Erich Knop was awarded various awards, among which are the Dissertation Price of Hannover Medical School (MHH) and the Felix-Wankel Research-Award of the Ludwig-Maximilians-University Munich (LMU) for research on Bio-Artificial Organs. Several times he received the Sicca Price of the German Association of Eye Practitioners (Berufsverband der Augenärzte Deutschlands, BVA) for research on Ocular Mucosal Immunity and Dry Eye Disease. After his research on Contact Lenses, the main area of Erich Knop´s scientific interest is on the different mechanisms that integrate to form the Anatomical & Functional Unit of the Ocular Surface (secretion, innervation, lid motility, endocrine regulation, stem cell biology, mucosal immunology etc.). Dry Eye Disease, that represents a complex dysregulation of the ocular surface functional anatomy, has thus always been of central interest to Prof. Knop. A central milestone of his research is the identification of the continuous physiological mucosal immune system at the ocular surface that his group has termed the “Eye-Associated Lymphoid Tissue” (EALT). This encompasses the ocular surface proper (cornea and conjunctiva), that is maintained by the tear fluid, together with the ocular mucosal adnexa of the lacrimal gland and the lacrimal drainage system, for the production and disposal of the tears, respectively. The recognition of the ocular mucosal leukocytes, afore misunderstood as ´inflammatory cells´, as the physiological resident mucosal lymphoid system has allowed to explain how and why initial tissue alterations in Dry Eye Disease, initiated by e.g. mechanical irritation and hyper-osmolarity, can typically progress into a chronic progressive inflammation. Chronic inflammatory Dry Eye Disease thus reflects Chronic Mucosal Inflammation as known from other mucosal organs of the body such as the intestine. Another focus of research is on the lid tissues including the Meibomian Glands, and the different zones of the lid margin, such as the posterior lid border, with the lid wiper and line of Marx, that are all of utmost importance for ocular surface integrity. As the chair of the Subcommittee for Anatomy, Physiology and Pathophysiology of the Meibomian Gland at the TFOS MGD workshop, Prof. Erich Knop has supervised and collected the evidence that Lipid Deficiency due to the Meibomian Gland Dysfunction (MGD) is in fact the primary causative factor for Dry Eye Disease in the vast majority of patients – which translates to about 4 out of five patents. His research group in collaboration with Donald KORB, Caroline BLACKIE and Jack GREINER from Boston, MA, was the first to show that an elevated epithelial lip composed of a non-squamous conjunctival epithelium forms the Lid Wiper at the tarsal aspect of the posterior lid margin. The posterior lid margin is the zone in contact with the bulbar epithelium that is responsible for the maintenance of the pre-ocular tear film because it supports the tear meniscus as the upper and lower ´ends´ of the tear film. The lid wiper, on the other hand, of the upper lid removes and re-distributes the Tear Film. It removes the tear film during the down-stroke of the upper lid and re-distributes a new tear film during the upstroke of a blink. In another study it was shown that the Lid Wiper has an own built-in lubrication system composed of hitherto unknown goblet cells and goblet cell crypts that can supply the surface of the Lid Wiper with a thick mucin-water gel for lubrication during its more than 100 meters of accumulated travel over the bulbar surface every day. He publishes in internationally renowned journals, contributed book chapters and serves as a reviewer for several journals such as IOVS, Exp. Eye Res., Curr. Eye Res., JJO, Contact Lens & Anterior Eye, Eye & Contact Lens etc. He is member of numerous international anatomical and ophthalmologic societies. He served as the programme secretary, chairman for the section of anatomy & cell biology of the European Association for Vision and Eye Research (EVER, www.ever.be) for a decade, and was the EVER Vice-President 2010. He was a member of the governing board of the Tear Film and Ocular Surface Society (TFOS, www.tearfilm.org, Boston, MA). He has served in several international Workshops of the TFOS, e.g. on the Topics on Meibomian Gland, where he was chair of the Subcommittee for Anatomy, Physiology and Pathophysiology of the Meibomian Gland at the TFOS MGD workshop, on Contact Lens Discomfort (CLD) and presently he serves in the Workshop on Dry Eye Disease (DEWS II). Prof. Knop is organizing international congresses and numerous special interest symposia at international congresses including the EVER, TFOS, ICER, World Ophthalmological Congress (WOC) and World Health Summit (WHS). After her study of Medicine at the renowned Hannover Medical School (MHH), Germany, Nadja Knop graduated as a medical doctor from the same institution. She has earned her doctoral degree for an extensive research study on the presence, distribution and composition of the Conjunctiva-Associated Lymphoid Tissue (CALT) in different animal species and in the human. This provided that first evidence world-wide for the existence of a physiological CALT tissue at the normal human ocular surface. Nadja Knop received a thorough education in Anatomy, Histology with Light- and Electron Microscopy and Immunohistochemistry. Her studies were performed in the Department for Cell Biology and Electron Microscopy under the supervision of Prof. Enrico Reale, a legendary cell biologist and electron microscopist, - a scholar of the inventor of the electron microscope, and in the Department for Neuroanatomy and Stomatological Anatomy under the supervision of Prof. Hans-Joachim Kretschman, the founding director of Neuroanatomy at the MHH. She has later collaboratively worked of the Research Laboratory of the Eye Clinic at the Charité–Universitätsmedizin Berlin, Germany and continued her research on the electron microscopical anatomy of the Conjunctiva-Associated Lymphoid Tissue of the Rabbit including the presence and morphology of antigen-transporting M-cells that have a morphology which is distinct from ordinary mucosal M-cells e.g. in the intestine where they were originally described. Nadja Knop continued her studies during a research Humboldt/JSPS fellowship in Japan in the Departments of Neuroanatomy and Cell Biology under the supervision of Prof. Yasuo Uchiyama. Nadja Knop was awarded various awards, among which are two times the Sicca Price of the German Association of Eye Practitioners (Berufsverband der Augenärzte Deutschlands, BVA) for her innovative research on Ocular Mucosal Immunity and Dry Eye Disease. Dr. Nadja Knop´s research on the presence of the Conjunctiva-Associated Lymphoid Tissue is in line with her scientific interest in immunology and in the different mechanisms that integrate to form the Anatomical & Functional Unit of the Ocular Surface. She was interested in the mucosal system of the body and the question whether or not the ocular surface could be a regular outpost of this system caught her interest. By studying the complete literature on conjunctival morphology dating back to the nineteenth century she became increasingly fascinated by this issue. When she started her study, the presence of a normal conjunctival physiological mucosal immune tissue was only hypothesized for some animal species, whereas leukocytes in the human ocular surface were regarded as pathologic. Incidental findings for the preferred laboratory animal species of the rat and mouse, that were extrapolated to the human situation, seemed to support a presumed absence of a conjunctival mucosal immune system. In fact, Nadja Knop could later conclusively verify this system in a large number of human tissues. After Dr. Nadja Knop had reported evidence of the presence of a regular Conjunctiva-Associated Lymphoid Tissue (CALT) in the rabbit, she continued her research in a laborious study on a large number of human tissues. Thereby she could verify that all normal human conjunctival tissues contain an ordinary mucosal immune tissue that is composed of a Diffuse Lymphoid Tissue and of organized lymphoid follicles – both of these can be associated with the conjunctival crypt system. CALT in the human has a typical topographical distribution with a preference in the palpebral and orbital conjunctiva and it is more expressed along the lid margin and at the nasal and temporal palpebral sides. It became obvious to her, that the distribution of the human CALT lymphoid tissue is suitable to act as an immunological ´cushion´ during eye closure for the cornea that is itself optimized for the visual function and has only few immature or no leukocytes and lymphocytes. Another focus of research is on the lid tissues including the Meibomian Glands, and the different zones of the lid margin, such as the posterior lid border, with the lid wiper and line of Marx, that are all of utmost importance for ocular surface integrity. She has served as a member on the Subcommittee for Anatomy, Physiology and Pathophysiology of the Meibomian Gland at the TFOS MGD workshop and has contributed, among other input, by composing the eminently important chapter on stem cells, that has very much inspired the research. This is even the more important as the Meibomian Glands show a distinct loss of glandular tissue due to Meibomian Gland Dysfunction (MGD) which is in fact the primary causative factor for Dry Eye Disease in the vast majority of patients – which translates to about 4 out of five patents. The finding of Gland Drop-Out raises the stem cell related question, whether the enormous advancements that have been made in Diagnosis and Therapy of obstructive MGD may eventually translate into a potential re-gain of secretory gland function. 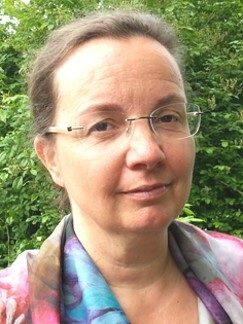 Dr. Nadja Knop´s research group in collaboration with Donald KORB, Caroline BLACKIE and Jack GREINER from Boston, MA, was the first to show that an elevated epithelial lip composed of a non-squamous conjunctival epithelium forms the Lid Wiper at the tarsal aspect of the posterior lid margin. The posterior lid margin is the zone in contact with the bulbar epithelium and it is responsible for the maintenance of the pre-ocular tear film. This is because it supports the tear meniscus as the upper and lower ´ends´ of the tear film. The lid wiper, on the other hand, of the upper lid removes and re-distributes the Tear Film. It removes the tear film during the down-stroke of the upper lid and re-distributes a new tear film during the upstroke of a blink. In another study it was shown that the Lid Wiper has an own built-in lubrication system composed of hitherto unknown goblet cells and goblet cell crypts that can supply the surface of the Lid Wiper with a thick mucin-water gel for lubrication during its more than 100 meters of accumulated travel over the bulbar surface every day. She served as the program secretary and later as the chairwoman for the section of anatomy & cell biology (ACB) of the European Association for Vision and Eye Research (EVER, www.ever.be) for almost a decade, and was the EVER Vice-President 2015. During this time, she has repeatedly submitted and promoted initiatives for the promotion of females in science, for research and education funding programs of the European Union, and for integrating patients as stakeholders in ophthalmologic research. Dr. Nadja Knop is organizing international congresses and numerous special interest symposia at international congresses including the EVER, TFOS, ICER, World Ophthalmological Congress (WOC) and World Health Summit (WHS).